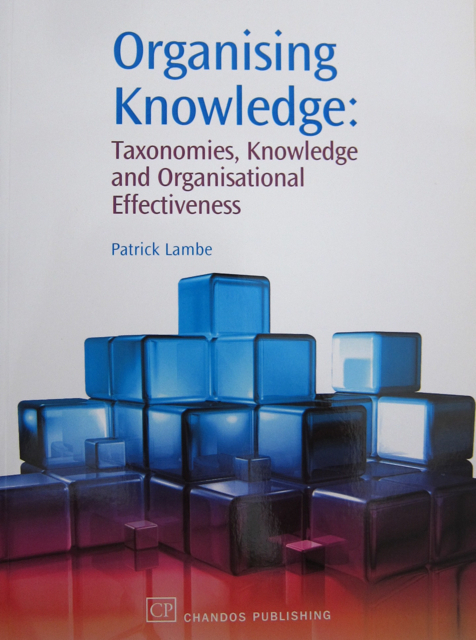 This widely recognised 2007 book by Patrick Lambe is still the only major text on how taxonomy work integrates with and supports knowledge management. This book frames the role of taxonomy work inside the larger knowledge management agenda. This is the first taxonomy book that combines a practical guide to taxonomy development with a broader explanation of how taxonomy work contributes to knowledge management in a variety of ways. Taxonomy work is not just useful in supporting information retrieval (which is the popular starting point for taxonomy projects), but as a key tool for supporting organisation effectiveness, expecially in supporting coordination across organisation boundaries. This book communicates a tricky subject in a clear, accessible style, suppprted by detailed case studies to support the arguments made. A final chapter looks at where taxonomies sit in relation to folksonomies and ontologies. In this book, taxonomy work finally enters the knowledge management mainstream. Published in the UK by Chandos Publishing, Oxford, in 2007.